La fotografía fue tomada en el nivel mezzanina de Parque Central, recién construído, actualmente es peligrosísimo pasa por ahí solo, mucha inseguridad, los pantalones eran un boom para esa época, yo tuve imitaciones, nunca los originales. En los 80 el jingle del comercial era “Mon Ami, el pantalón que se parece a ti al estilo de tu cuerpo”. Y yo me acuerdo que jodía con mis primos (estábamos chamitos) con ese jingle. ja ja ja ja!!!! si me has hecho reir Diyadira!!! una frentota!!! la bicha!!!! ja ja ja!!! de pana que tienes chispa!!! besos para ti!!! LOS USASTE? PORQUE YO NO? I’d come to bury the hatchet with you here. Which is not something I usually do! I enjoy reading a post that will make people think. Also, thanks for allowing me to speak my mind! Dude, please tell me that youre going to write far more. I notice you havent written an additional weblog for a while (Im just catching up myself). Your blog is just also important to become missed. Youve got so much to say, such knowledge about this subject it would be a shame to see this blog disappear. The internet needs you, man! I would like to thank you for the efforts you have made in composing this blog. I am hoping the same top-quality blogpost from you in the future as well. In fact your creative writing abilities has inspired me to get my own blog now. Truly the blogging is spreading its wings quickly. Your write up is a fine model of it. This particular site is often a walk-through for all of the info you wanted relating to this and did not know who to ask. Glimpse right here, and you will definitely uncover this. I am impressed, I have to say. Really rarely do I discovered a blog that is both educative and entertaining, and let me tell you, you’ve hit the nail on the head. Your article is important; the matter is something that not many people are speaking intelligently about. I am really happy that I stumbled across this in my search for something relating to this. I am not able to enjoy this site correctly on opera I believe there is a issue. details view of the matter. information, It is nice to see thoughts that tell more of the story, they are more helpful in nature. Damn, very nice website. I came across this on Yahoo, and I am really happy that I did. I will definately be revisiting here more regularly. Wish I could add to the post and bring a bit more to the table, but am just taking in as much info as I can at the moment. Hello.This article was extremely fascinating, especially because I was searching for thoughts on this issue last Tuesday. Truly incredible and informative blog page publish the following. I just wished to comment. thank you for posting this. IвЂ™ve bookmarked your blog site and IвЂ™ll be back to go through more inside the future my friend! Also great colors on the layout, itвЂ™s really uncomplicated on the eyes. Tremenda foto de época, jeje claro que los recuerdo porque aunque estaba chamo viví esos tiempos, y también era el estilo infantil. Ese estilo de foto y de pantalón me hace recordar esas viejas carátulas de LP de los Terrícolas, Pasteles Verdes, 007, etc. Por cierto, la contextura de la gente también es un ícono. Un chamo que se prestase de pavo debía usar camisas talla “S”, nada de gimnasio ni hormonas y las pavitas con sus pechitos naturales. Dios!!! 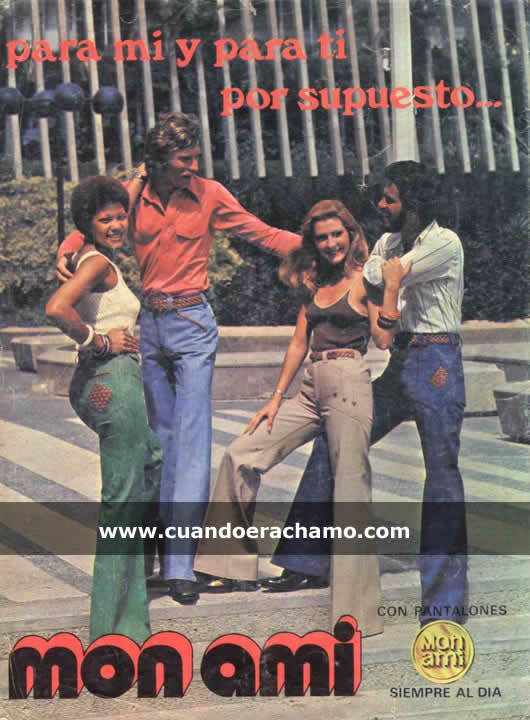 Yo use esos pantalones para un diciembre con unas botas “machote” que espectáculo sería eso. Recuerdo que después de las 12 que salíamos a dar el feliz año por la zona, casi no podía andar con las plataformas. Más nunca me puse las botas y el pantalón creo que tampoco.